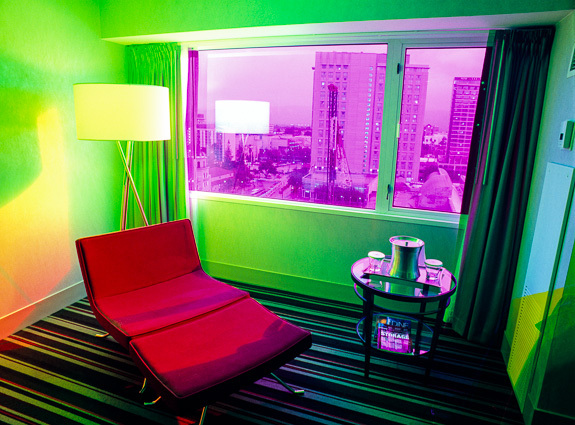 Tempus Incognitus explores the transitory nature of modern life using hotel rooms in which time and space fade into one another. These images challenge our intuition about time itself and ask about the stories held within these walls. Think Edward Hopper interiors awash in James Turrell colors with David Lynch directing. 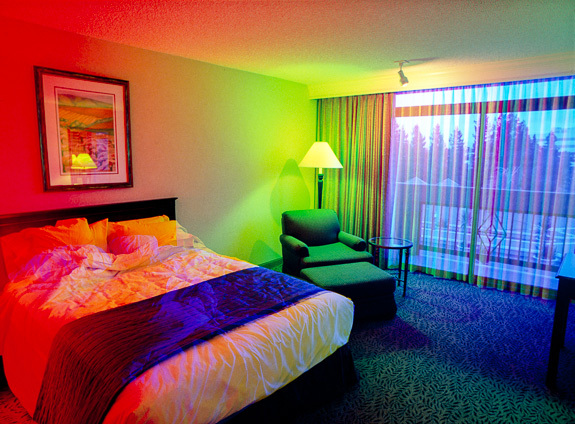 These hotel rooms lack personal effects to invite a narrative. Tempus Incognitus records the day’s transitional times and shows them existing concurrently. The Cubists painted individual scenes from several different perspectives at once. In this series, I photograph individual rooms at several different times of day from a single perspective. I use a time-intensive technique that captures the evolution of light and emphasizes change in vivid colors. Multiple exposures are taken over two days and images are created in camera and on film with no digital manipulation. Each image is composed of three to nine exposures. Only the light in the room is used — no colored lights or gels are added.